Richard H. Cox (M.D., Ph.D., D.Min.) is president emeritus of Forest Institute of Professional Psychology in Springfield, Missouri, and teaches in the department of psychiatry and behavioral sciences as Duke University Medical School. The author describes his book this way: “Rewiring Your Preaching is not an explanation of the neuroscience of faith, but of how the knowledge of neuroscience enables faith. The hope is that we can gain sufficient understanding to provide an elementary grounding and deep respect for how God uses our brains in the journey of faith” (20). 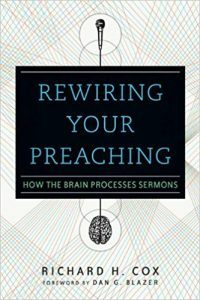 Earlier, the author asserted, “The psychological and neurobiological fields have raised the bar on our understanding of how preaching can be done and how sermons are received and interpreted by the brain. Intentional, purposeful preaching can actually produce new neural pathways that cause the brain to change the way it thinks and how its owner acts” (19, italics his). Rewiring Your Preaching includes an opening chapter in which Cox references the research of neuroscientist Andrew Newberg, who believes that there are “God circuits” in our brains. Among other things, these “God circuits” mean that “intense, long-term contemplation of God and other spiritual values appears to permanently change the structure of those parts of the brain that control our moods, give rise to our conscious notions of self and shape our sensory perceptions of the world” (26). Newberg’s findings don’t appear to be restricted to the Christian faith. In the following chapter, Cox quotes the Roman Catholic theologian Karl Rahner (39) to explain the concept he calls religare, that is, “the ability to attach new learning to old” (11). Pastors in a synod that has historically emphasized the Christian education of children will be encouraged to hear Cox say, “How adults think about God is directly related to the roots that have been nourished in them as children, so that there is a basis for new thoughts to tie back to what is already accepted thinking” (39). There’s additional encouragement as Cox notes that “the brain stores visual photographs for future use,” leading him to conclude, “There may be a message here for churches that have no stained glass windows, no architectural symbols, no outward signs of being a place of worship. Their images present photographic imprints on the brain that are very different” (43, italics his). Later Cox speaks of “continuous and consistent teaching” that “allows the development of deeply embedded belief systems” and recommends “repetitive varying explanations” that allow sermons to be sufficiently understood (45). At the end of his book, Cox summarizes, “There are many rocks on which the church is being built, and local congregations have much to consider and reconsider. Preaching has never lost its power, but many preachers have. It has been abundantly demonstrated through history, throughout the Scriptures (both Old and New Testaments), throughout worldwide missionary endeavors and now through the latest neuroscientific discoveries that preaching works. Preaching must once again be elevated to a position of prominence. We know both that it works and why it works” (172). That paragraph does a lot to explain my reaction to this book. I’m not sure there are many WELS pastors who need to be convinced that preaching the Word of God works. We’ve known that repetition (the lectionary! ), simplicity and consistency are vital in preaching. Few of us would doubt the value of symbols. If we didn’t believe that preaching can change the way people think, why on earth would we keep doing it? This book, then, serves to confirm some of the things we learned early on and have practiced throughout our ministry. Whether there are actually “God circuits” in the brain is something that neuroscientists can debate; Scripture simply tells us to “preach the word” and promises that “faith comes from hearing the message” (Rom. 10:17). I do have something of a concern that an overemphasis on recent neurological discoveries could leave the impression that preachers in former times were laboring at a great disadvantage. Yet, somehow John the Baptist and the apostle Peter (Acts 2) managed quite well even though they lacked the benefit of the latest findings in brain research. There were more than a few places in the book where I disagreed with the author. “The concept of grace… is a New Testament concept altogether” (168). After writing, “Preaching to educators regarding the necessity of healing within the educational community is our responsibility,” Cox asserts, “Some would argue that the church should stick to the gospel and stay out of social issues. Only those who have not read or refuse to follow the dictum of the Old Testament prophets, the Sermon on the Mount and the writings of Paul dare to say such things” (165). There were several instances where I would question Cox’s application of Scripture, but in one case his reference is simply mistaken. In the chapter on “Getting to the Brain with Theology,” Cox is attempting to make the point that “the original idea of healing arose out of the Old Testament concept of holiness, which spoke of an intimate, personal and total relationship to God the Holy One” (125). He finds this concept expressed in the Greek words hagios and holokleria, as well: “Paul used the adjective holokleros, which speaks to the same concept of completeness–that is, total relationship to the Holy One. ‘Now may the Lord of peace himself give you peace at all times in all ways (holokleron)’ (2 Thess. 3:16)” (126). However, the Greek word holokleron is not used in that verse. Perhaps the author intended to refer to 1 Thessalonians 5:23. The author’s discussion of “woe” preaching vs. “woo” preaching (168) is the closest he comes to touching on law/gospel preaching. Cox, though, seems to equate law preaching with the Old Testament, while gospel preaching is a New Testament phenomenon: “…the Christian message differs significantly from that of the Old Testament in its emphasis on God’s provision of grace in spite of human frailty” (169). Isaiah, I’m sure, would disagree. Perhaps it sounds immodest, but I didn’t find anything in this book that would cause me to “rewire” my preaching. The value is more along these lines: it confirms that what we learned in Seminary homiletics classes coincides very well with recent findings in brain research. Surprise, surprise.